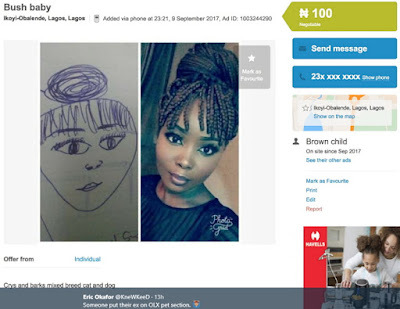 A jilted Naija man who is determined to destroy the image of his former girlfriend has put her on sale on an online classifieds website. The bizarre advert posted by one Eric Okafor on OLX classified site was spotted by a Twitter user @knewkeed. Heartbreak can make people do crazy things. Laughing oga rake am easy, there are other ladies out there. Now we know why she left u!